For ither uises, see Morelia (disambiguation). 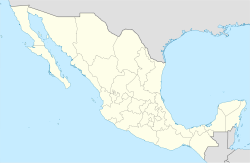 Morelia is a ceety an municipality in the north central pairt o the state o Michoacán in central Mexico. The ceety is in the Guayangareo Valley an is the caipital o the state. The main pre-Hispanic culturs here wur the P'urhépecha an the Matlatzinca, but nae major ceeties wur foondit in the valley durin this time. The Spainyie teuk control o the aurie in the 1520s. The Spainyie unner Viceroy Antonio de Mendoza foondit a dounset here in 1541 wi the name o Valladolid, which became rival tae the nearbi ceety o Pátzcuaro for dominance in Michoacán. In 1580, this rivalry endit in Valladolid’s favor an it became the caipital o the colonial province. Efter the Mexican War o Unthirldom, the ceety wis renamit Morelia in honor o José María Morelos, who hailed frae the ceety. In 1991, the ceety wis declared a UNESCO Warld Heritage Steid for its well preservit colonial biggins an layoot o the historic centre. This page wis last eeditit on 11 Mairch 2018, at 13:45.